Scientists know of 750,000 or so asteroids and comets—and all of them are part of this fine solar system. That is, all of them but one. And as new research shows, it’s weird as hell. Today, scientists are reporting their analysis of ‘Oumuamua, an interstellar object spotted last month. 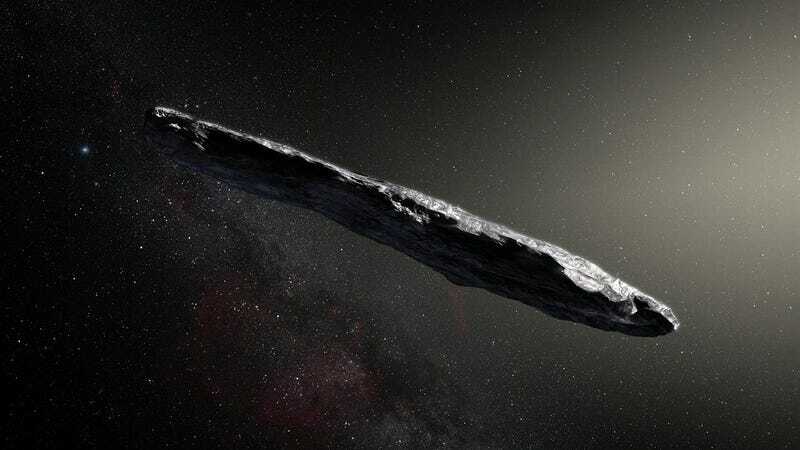 The oddly-shaped, fast-moving rock immediately surprised astronomers with its chemical makeup and other properties, which implied there should be far more interstellar objects floating around than previously thought. “The presence of ‘Oumuamua suggests that previous estimates of the density of interstellar objects were pessimistically low,” the authors write in the study published today in the journal Nature. ‘Oumuamua’s story begins on October 19, 2017 when the Hawaiian Pan-STARRS1 telescope system spotted it. Scientists named it A/2017 U1, but immediately realized that they were looking at something strange, since its orbit’s shape was extremely hyperbolic. That means rather than orbiting the Sun, this thing came and went with enough speed to “clearly” imply it was from outside the solar system. Observations of the wildly-varying light from ‘Oumuamua showed scientists it wasn’t spherical, but probably had a cigar shape measuring 800 meters by 80 meters by 80 meters—that’s something almost as tall as the Statue of Liberty, but half a mile long. It’s red, and likely made from metal and carbon-rich matter like some comets. Scientists also observed that it didn’t have a fuzzy, comet-like appearance, which is surprising given the fact that most observed rocks originating from the distant Oort cloud are comets. This set up a conundrum: Scientists assumed interstellar objects would behave more like comets than asteroids until ‘Oumuamua came along. If they’re more like asteroids, that implied to the team that there are way more of these interstellar rocks in the Solar System than originally thought, according to the paper. 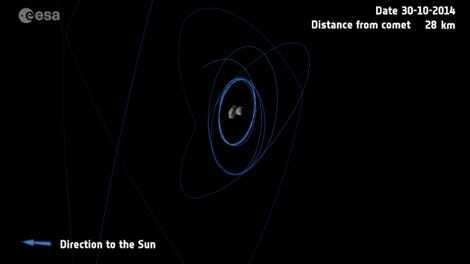 It also adds another factor when considering Earth impacts. “Impact from an interstellar object would be far more energetic than from a solar system object with similar mass, due to the larger impact speed,” the authors write. As far as where it came from—no one knows yet. The paper suggests a nearby debris disk, or that its trajectory was changed by some planet or other comet—maybe it was set off by the undiscovered Planet Nine. All that is informed speculation, of course. Scientists will never get to see ‘Oumuamua again as it speeds off—but it brief visit suggests might not be the last time scientists spot something like this.